Confession: I used to despise breakfast. I hated the idea of rushing out the door to school and forcing myself to hork something down in five minutes. But breakfast grew on me and it has since become a crucial part of my day. I can not function as a normal and polite human being without breakfast. 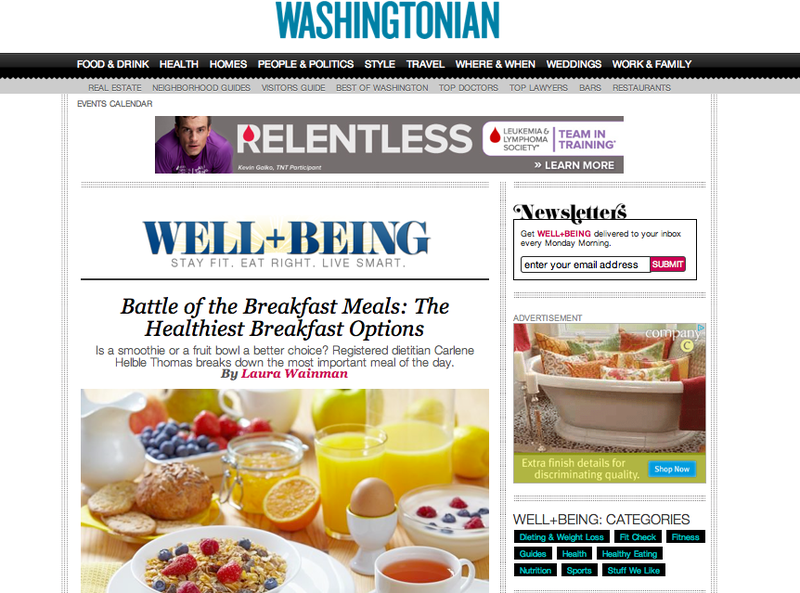 I recently spoke with Washingtonian's Well + Being blog about which breakfast options are best. In a face off, would bagels beat pancakes? Is a smoothie better for you than a bowl of fruit for breakfast? How can you make the 'bad breakfast' option better for you? I encourage breakfast...whatever it is! Any breakfast is better than skipping. Breakfast should be balanced with fruit, a whole grain, protein, and healthy fat. If you're willing to try veggies, you're a super star in my book! Diet cereals aren't enough to keep you running until lunch. Don't let your body crash! Think serving size. Many bagels are nearly three servings instead of one. Check out the fiber content of foods. Instant oatmeal is a loser compared to steel cut oats. What breakfast duds have you seen? Which breakfasts are your go to?